Changing the oil in your engine is probably one of the most critical things for you to do when it comes to vehicle maintenance. While gas, water, coolant, brake, and transmission fluids are all important for your car to have, they won’t come close to having the negative impacts you see with oil if you don’t take care of it on a regular basis. Engine oil is vital for lubricating the engine, absorbing heat, and allowing those parts in your engine that move to work well with each other. With the passing of time, heat from the engine can break down the oil and reduce the lubricating properties it has. Oil is also beneficial to neutralizing acid that might be in the engine, but again, this process also breaks down eventually. Oil can also absorb small amounts of dust, combustion byproducts, and water that get in the engine. That said, as the heat from the engine breaks down the oil, it can lose the ability to absorb these things and they can start to stick in the engine and can lead to major issues with the engine, and that can lead to massive car maintenance trouble. Think of the oil as the blood that goes through our bodies. We don’t need to replace or change our blood because it is a naturally process that our body does itself. Blood does get pumped to each area of the body, however, in order to ensure that everything can work properly. If an area of the body doesn’t get blood, it can and will shut down. Your car engine is similar. It will stop operating smoothly if it does not get the correct amount of oil or if its old oil doesn’t have fantastic lubrication properties. In the following paragraphs, you will learn how to change the oil as well as the filter as changing the only the filter and nothing else is ever recommended. If you aren’t sure when the last time you changed your oil was, it is really quite simple to find out how long it has been simply by checking the clarity of the oil. You might compare it to when you shampoo your carpet. As you are cleaning the carpet, you might notice the water turning brown. Eventually, the water is not clean and will need to be changed. No, checking the clarity of your oil isn’t exactly a science, but checking it out might just keep you from ending up with serious maintenance issues down the road. The oil in your engine works to absorb the heat that the engine puts off while also lubricating the moving metal parts that might otherwise grind against each other. As you use your car, the oil pump works to circulate the oil in your engine while the oil filter catches any deposits that can build up as time goes by. The filter itself is critical as it keeps the oil clean. However, as the oil ages, the amount of deposits it holds will continue to build until eventually the filter will not be able to get all of those deposits out. Once it gets to this point, the oil will begin to change color, and this is indicative of it needing to be changed. If you want to check the clarity of your oil, turn on your car and let it run for a couple of minutes before turning it off. Open the hood and locate the dipstick for the oil. Pull the dipstick out and check the color and level of the oil. If you notice that the color is dark brown or maybe even black, it is time to change the oil. If the color is lighter than that, then you still have a bit of time before you need to change it. Changing the oil is an easy and fast maintenance fix, so don’t let it intimidate you. If you have determined that the clarity of the oil indicates that it is time to change the oil, don’t waste time getting it done. If you wait too long, it can wreak havoc on your engine. There are a couple of steps you should take before just draining the oil. The first thing you need to do is to make sure that you have the tools you need to get the job done. These include a socket wrench, that will allow you to be able to remove the bolt that holds the oil pan. You will also need a wrench for the oil filter as well as a receptacle to catch the old oil and store it until you can safely get rid of it. A good idea might be to have a pair of rubber gloves as well as some old newspapers or rags too. The next thing to do will be to drive your car around the block so that the engine can warm the oil up a tad. Making the oil warmer will allow it to drain out of the engine faster. Once you have done that, park the car on a surface that is flat, turn it off, and let it sit for about 10 minutes. This will give all of the oil time to drain into the oil pan. If your vehicle sits too low to the ground for you to get under it, just drive it onto a couple or car ramps or put it on a couple of jack stands so that you have the room you need. Find the drain plug under the vehicle. It should look like a large nut and be at the very bottom of the oil pan. It is typically the thing that is the closest to the ground. If you aren’t sure about its location, check your car’s owner’s manual or get your local mechanic to show you where it is the next time you take the vehicle in for maintenance. Use a socket wrench to get that nut loose. Remember that the oil in the pan is still hot, so don’t try to catch that nut when it falls off. Make sure your receptacle to catch the oil is in place before getting the nut out all the way. Once you have the nut out, the oil should just flow right into the receptacle. This should take only a couple of minutes. Now it is time to change the oil filter. Keep in mind that this filter holds all of that excess grime and sludge that is caught by the oil as it lubricates the engine. Changing this filter is critical when it comes to vehicle maintenance because if you don’t have a new filter in place when you change the oil, the new oil will have to go through the old filter and this can make it both less effective and dirty. You can look at your owner’s manual to determine the size of the oil filter you need. You can also check the little computers at your local auto parts house. 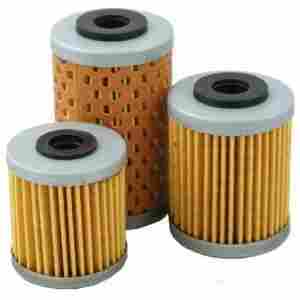 Oil filters are relatively inexpensive and go for $5 to about $20. 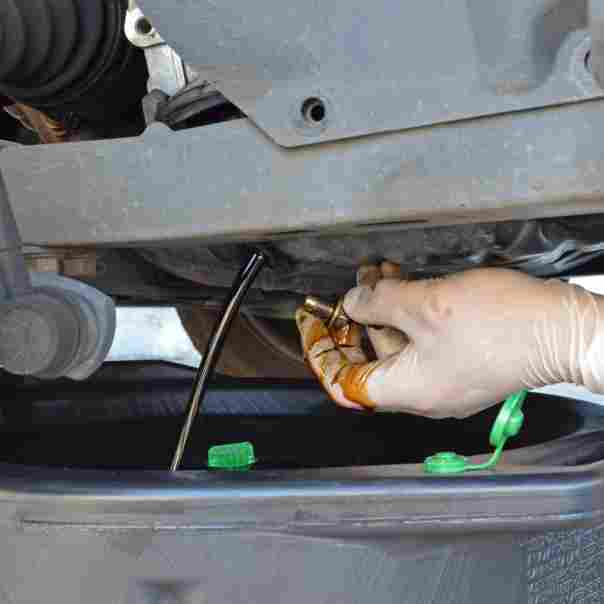 While you are under the car and the oil is draining, look for the oil filter. It should be cylindrical in shape and can be orange, black, white, or blue, depending on what brand it is. Using the oil filter wrench, turn it counterclockwise to get the filter loose. Keep in mind that the old filter will still have a bit of hot oil inside it. You should only need to turn it once with the wrench before it should be loose enough to twist it off by hand. Before you put the new filter in, take a little of the clean oil and rub it along the gasket of the filter you will be installing. 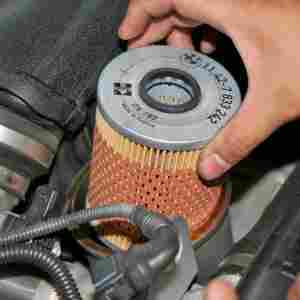 This will assist the filter in getting a snug fit on the engine block. 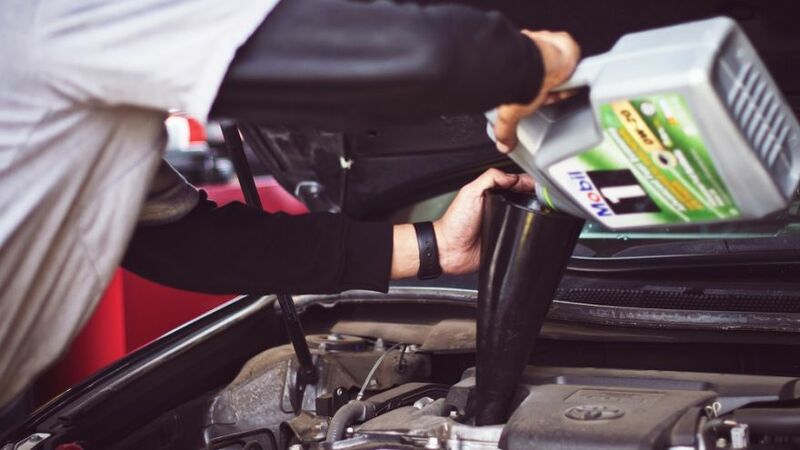 For excellent vehicle maintenance, you might also want to use a rag and clean off any of the excess oil around where you screw the filter into the engine. Now, take the clean filter and screw it onto the engine block. Once you have it snug, use the filter wrench to tighten it. Keep in mind that it should be tight, but not too tight so that the filter doesn’t get damaged and leak. Before you fill the engine back up with oil, you need to check the owner’s manual or a service manual at your local parts house to determine the type of oil you need and how much it will take. Most engines use anywhere from 4 to 6 quarts. 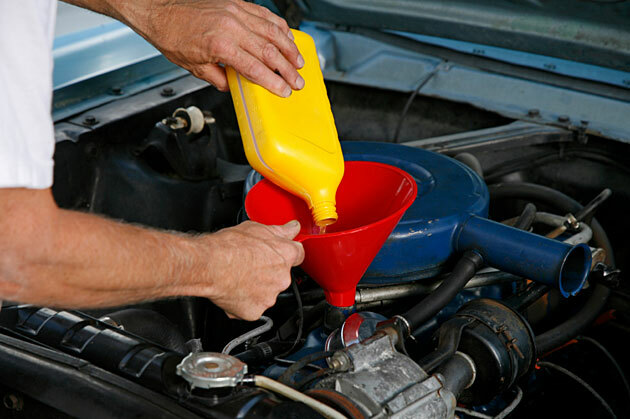 Once you have your oil, use a funnel to funnel the oil where it goes so that it won’t spill on the engine. 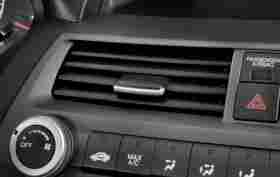 If you get some on the engine, it could get hot enough to start a fire while you are driving. Once you have put the right amount of oil in, put the lid back on, close the hood, and drive the car off the ramps or lower it from the jack stands. It might take the new oil a few minutes to get all the way to the oil pan since it is cold. The level of the oil on your dipstick should be right under the “full” mark. Remember that you never want to add too much oil to your car. If you add too much, the oil can come into contact with the crankshaft. This crankshaft spins at a rate of many thousands of times a minute and can actually whip your oil into a froth. You don’t want this to happen because if it does, the oil pump won’t be able to get the oil to the parts of the engine that need it. This can then lead to serious issues with the engine and can end up costing thousands in repairs. Once you have the right amount of oil added back to the engine, turn the vehicle on and let it run for a few minutes, allowing the oil to circulate. After this has been done, you can check the ground under the car for any oil leaks. Keep in mind that used oil is quite a hazardous material and you need to get rid of it properly. Many gas stations, vehicle maintenance shops, and recycling centers will accept used oil filters and oil. How often do you need to change your oil? Most of the experts agree that you should change it every 3,000 to 5,000 miles, or every 3 months. That being said, some manufacturers, such as Ford and Toyota, say that you can wait until 6,000 miles or 6 months passes between oil changes. However, seeing how easy this maintenance issue is and how critical it is to the engine, 3 months or 3,000 miles is still a good rule of thumb. Some vehicles have been equipped with a warning light that will let you know when specific things need to be done. If your vehicle ever displays a light for “low oil” do not ignore it. Stop the car, check the oil level, and add however much it needs as soon as possible.